Run Unit Tests With Automatic DBPro DB Deploy from a Team Build – Benjamin Day Consulting, Inc. This time I’m genuinely surprised that no one has tackled this and posted it on a blog or to the DBPro or Team System forums. When you add a unit test for a stored procedure in Visual Studio Team System for Database Professionals (DBPro) for the first time, you get the dialog asking how you want to set up the unit test. It asks you what unit test project you want to put the new stored procedure unit in to. It asks you if you want to automatically deploy the database each time you run the unit test. It asks you if you want to execute any database data generation plan, too. You set all that data and hit OK and then it creates the new unit test for you, adds some stuff to App.config, and adds a file called DatabaseSetup.cs to your unit test project. You run the unit test and all is happy and wonderful. Ok. Here’s where it gets hairy. Run this unit test as part of a Team Build. Database deployment failed. 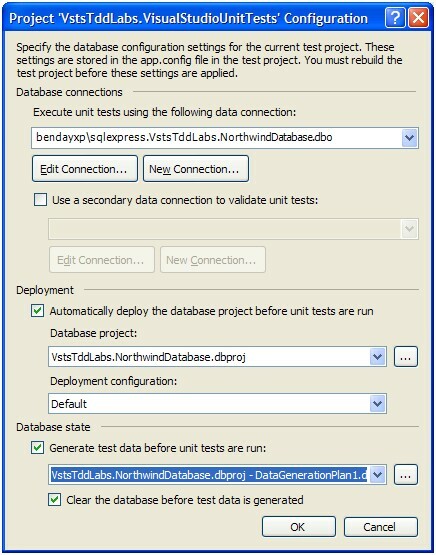 Path ‘c:buildAgileTeamProjectAgile Team ProjectBuild 1 VstsTddLabs.NorthwindDatabaseVstsTddLabs.NorthwindDatabase.dbproj’ is not a valid path to a database project file. Those relative paths with the “..” are kind of a dead giveaway. The folder structure when you run from Visual Studio is different from when you run/build on a TFS Team Build Server so those up-one-level (“..”) directives are making the unit test framework look for the project in the wrong location. Ok. So now how do we fix this problem without having to do open heart surgery on our config files at build time using a custom MSBuild task? My solution is to add some additional logic to the DatabaseSetup.cs project. Here’s what that file looks like by default. All we have to do is put a call to check and adjust the App.config settings before the call to DeployDatabaseProject(). In case you’re worried, this is ok because the App.config used to run the test on the build server isn’t marked as ReadOnly and isn’t version controlled. So, I added the call to CheckDbProPathsAndAdjust() which opens up app.config and validates the DatabaseProjectFileName and DataGenerationFileName values. If they don’t exist then it tries to modify them to where they’d be on a Team Build server. If the file exists at the modified location, then app.config gets edited and saved before the DBPro unit test framework tries to load it. The line of code that really does the fixing is actually quite simple. The DBPro project through Team Build actually lives one layer lower in the tree than it does in a Visual Studio build. So, just adding that additional “Sources” folder reference fixes it. Here’s the rest of the code. — Looking for Team Foundation Server or Visual Studio Team System training or mentoring? Need some help doing the Team Foundation Server installation or maybe some customizations to make TFS work smoothly within your development process? Contact me via http://www.benday.com. One Response to "Run Unit Tests With Automatic DBPro DB Deploy from a Team Build"